Meihua waits patiently while the Bomoh prepares her floral bath. 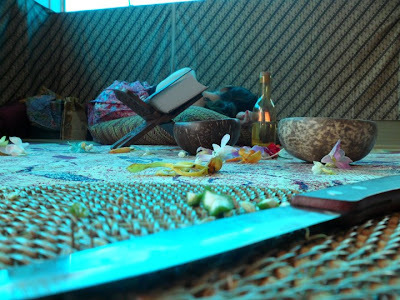 She lies down beside him like a secret lover complaining to him about his scandalous husband and racial stereotypes but the Bomoh, focused in his work ignores her. Meihua, reading the Quran casually find herself lonely in her problems. In the floral bath, Meihua’s mind wanders as she repeats the Quranic verses read to her by the Bomoh. Meihua finds solace in the ritual and in the physical and spiritual company of the Bomoh. 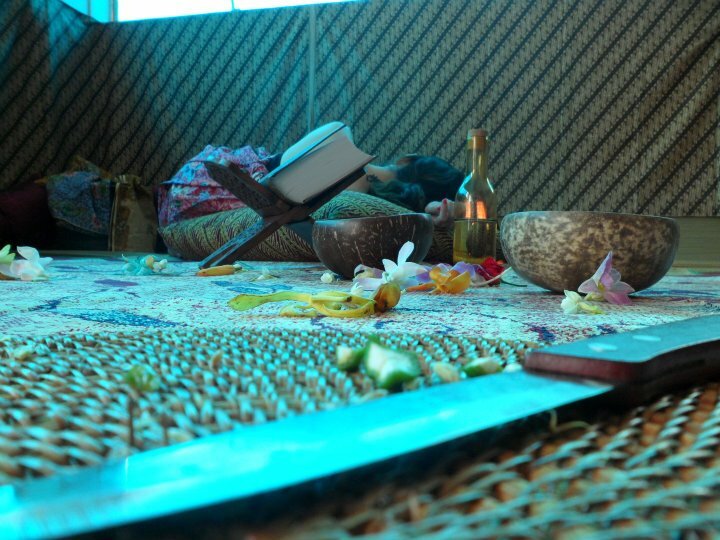 Their ritual turned sexual in a cosmic and almost surreal way as Meihua finds herself trying to satisfy the Bomoh. Although, the Bomoh feels complete after their secretive perverse ritual, Meihua questions herself if she finds what she is looking for. SINdie: Curious question, why the choice of a Chinese lady visiting a Bomoh? Yazid: The reason I chose a Chinese lady visiting a Bomoh is because I want the whole context to be very symbolic with racial and religious connotations. 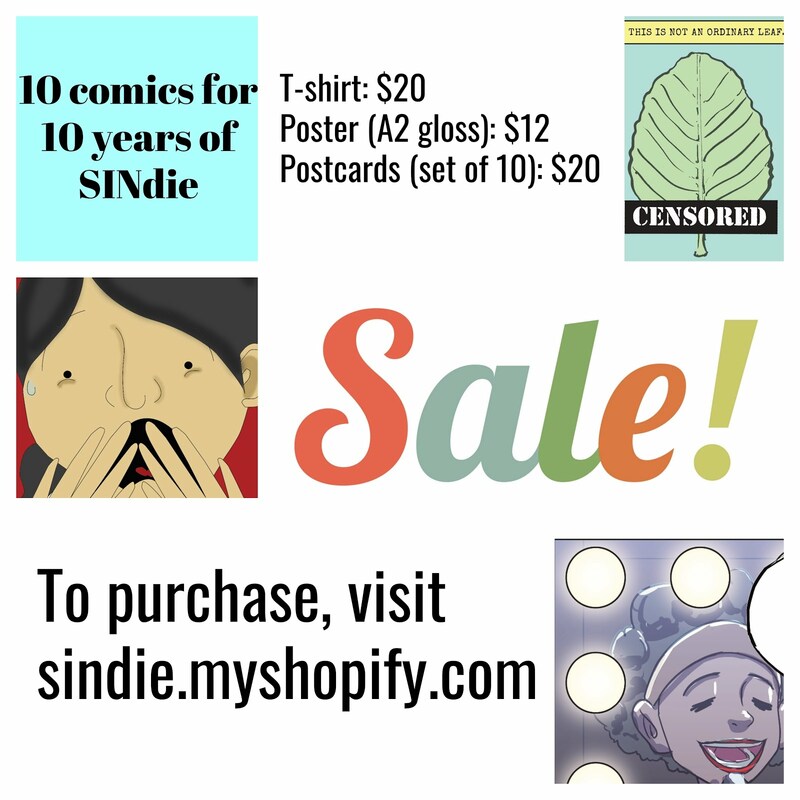 The Chinese lady is meant to be a “perfect” representative of the Chinese dominant Singapore in contrast to the eerily unattractive but wise Bomoh, which is meant to symbolize the Malays. S: Would the making of this film be blasphemous in any way? Y: Personally, I don’t see this film being blasphemous in any way because if the intent is to educate and make us realize the bigger issue at hand then I believe one should not see it as blasphemous. I had friends and even strangers who told me that they are irked by the disrespect and lack of modesty for the holy Quran in the film. For that, I can only tell them that, like what someone special to me said – that, is just a book, a book is a physical material which is man-made and in it are inked words that are printed in a factory but what matters is the “content”, and that’s if it matters to you, it may not matter to someone else. S: It is a very captivating story, what inspired you for this? Y: The inspiration for this film comes from my early childhood memory that still rings in my mind every time I hear of racial and religious “friction” in our society. The memory is simple and any suburban Malay boy growing up in a very Malay community would have known the story. Basically, every Malay, whether they would like to admit or not, is told that the Chinese and any other races that are Non-Malay, do not clean themselves after having their “business” done in the toilet. Moreover, strangely, this story is more targeted to the girls of the “other” races. Try asking this question to any Malays and they would certainly deny it but it is in my opinion that this is an idea ingrained in them growing up. Some would just laugh at the thought of it as being just a childhood joke meant for laughter but I believe otherwise. There is a more sinister reason behind this story – racial prejudice and the “sitting-on-a-high-horse” effect where just because you have a religion and culture that taught you a form of physical purity and cleanliness unique to your religion, it does not give you the moral right to look down on others. 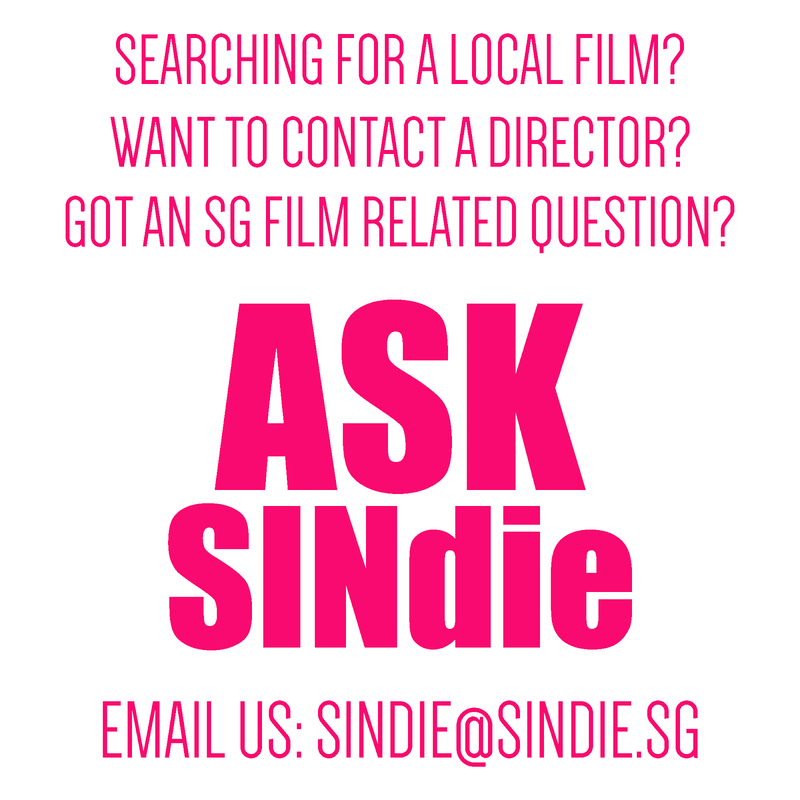 S: The sexual encounter of problem-stricken Chinese girl with a Bomoh is certainly thought provoking, what do you hope to achieve with this film? What do you want your audience to walk away with? Y: To answer your question, is simply this: with this inspiration in mind above, I set out to write this story and create this film as a social test and experiment. I bombarded the scenes with very obvious instances of blasphemy such as the “mishandling” of the Quran and the sexual atmosphere intertwined with Quranic recitations. By doing so, I want to see the reaction of everyone, the general public, religious or not and of any faith and race. Essentially what I would like achieve with this film is two things, firstly, for them to question the mythical peaceful co-existence of religion and race and secondly, if they were to be insulted and offended, is hopefully for them to question the reason behind their frustrations rather than take anything portrayed on the film at face value. S: Any interesting happenings during the shoot? Y: We had an amazing actress, Esther Low, who was quite sporting enough to do the floral bath scene among the many girls who were asked to take up the role and act for the floral bath scene. 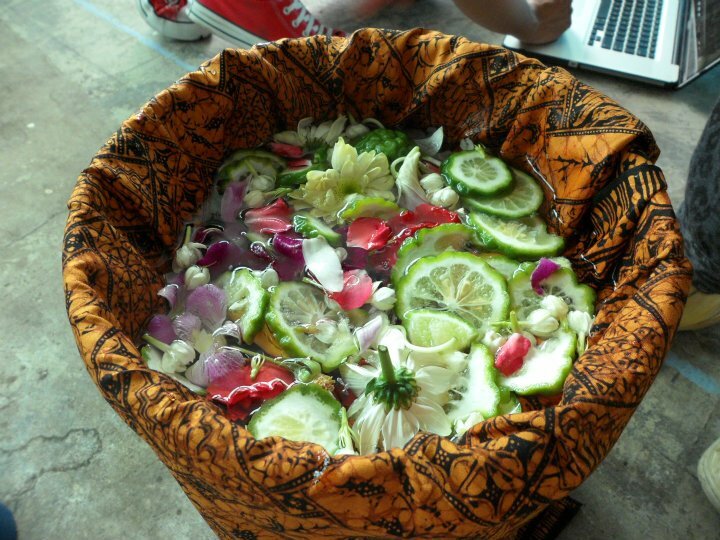 For the floral bath, we used the original ingredients for the floral water that consists of lime, varied type of flowers and water. What we did not expect or did not realize along the entire development and pre-production of the film, is that she is going to showered with floral water and it has lime in it. We only realized this during the shoot and the results? Our actress had a tough time trying to resist the acidic effect it had on her eyes as she swayed to the rhythm of the Quranic recitations. Thankfully enough, she got through the entire “ordeal” with amazing acting results. S: What were the biggest challenges in making this film? Y: The biggest challenge faced in making this film is the casting because before Esther came along, we had the casting call opened up for a month and there were no interested parties coming forward due to the nature of the film and the scenes in it. I can only imagine their discomfort upon knowing that religious and racial themes are involved in the film. Among the many that came forward, most of them expressed their apprehension to a couple of the scenes originally which is intended to be more physical initially but later tweaked to bring forward an idea rather than a straightforward image. 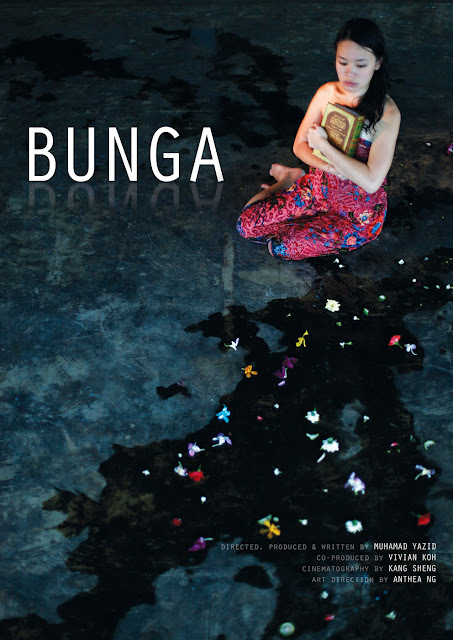 Bunga was screened during the 3rd Singapore Short Film Awards in March this year.